About a month ago, we got information and published that Econet wad preparing to re-launch what used to be (a nightmare) called EcoLife. 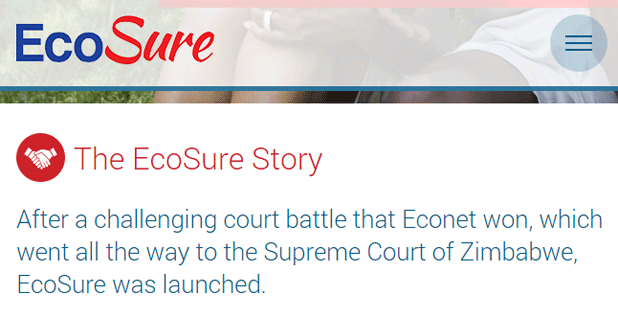 Today, that product is being officially launched in Harare, but under a different name – EcoSure. This is one product that has taken Econet a long time to deliver both because of the nightmare of it’s previous life, and also, we think so at least, because they were changing the model too. When we broke the news last month, we’d been told they weren’t ditching the EcoLife name, but that clearly is not the case. As for the model, here’s the difference: With EcoLife you’d get cover for just spending a minimum of $3 airtime a month (Econet liked to call it ‘free‘ cover), where the new EcoSure model is monthly subscriptions that you have to pay in real money. It’s similar to what Telecel launched almost 3 months ago. In model only at least. We’re at the event where Econet is launching this product and we’ll update with more details later when we have them. The Telecel package seems to be much more comprehensive, I think if they added funral cover they could give Ecosure a run for its money! Where is Netone in all this???? Telecare does have funeral cover: $250. I like the fact that Telecel comes with other things for the guy that’s paying (the hospital especially), albeit a paltry amount. What makes EcoSure more attractive is they allow you to pay more for more cover. Which life assurance company are they using to deliver this service? Dont they have their own life Assurance company? Econet robbed people before on EcoLife now what stops them from doing it again.Mbavha imbavha period!And they take advantage of our weak legal system…My advice try Telecel at least when they say something they do it! How exactly were you robbed? Did you make a claim and didn’t get a payout? I’ve never understood how people think they got robbed! It’s as if when people buy car insurance for one term, they automatically feel robbed if that term expires without them having claimed anything. The reason why people end up blaming Econet products is because you just subscribe to anything that you come across without questioning the relevance of the product to you let alone the price and the terms and conditions. There is mobile news, caller tunes, bundles, sms and win, scratch and win and whatever but do you need all that and can you afford? Complain about their tariffs not their VAS. This nonsense of comparing Telecel and Econet is just plain ridiculous a sim card will cost you close to nothing so move over and shut up. Can l have Full detail about Ecosure please? Can l have full details of how ecosure operates,l mean in the event of any mishap how does one make a claim and which people does it cover?lt would seem a noble idea but they (ecosure) need to explain fully to their subscribers on how this system operates.Why can’t they sell their product professionally just like those guys from Funeral Assurance Companies so that tonzwisisa. I agree with Stressed that Mr Steve Masiyiwa with very soon lose his credibility and image because his team and these VAS are not operated in an honerable way. Ini handina kumbo subscriber zve Ecosure izvi uye handinei nazvo nokuti ma life insurences angu andinawo akandikwanira BUT to my surprise I a dollar has been deducted from my ewallet without my cocernt ndihoumbavha hwacho ihwohwo.